In this tutorial using phrase morphing is presented. 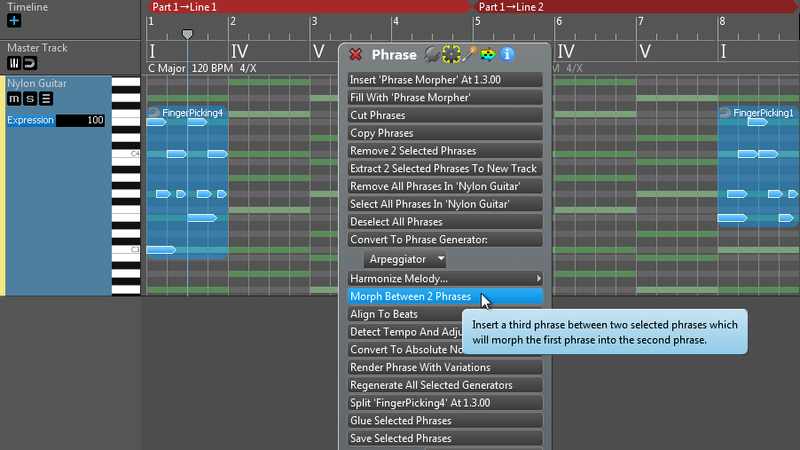 This powerful feature means that when you place a 'source' and 'target' phrase in the composition, the phrases between the two will be composed automatically by RapidComposer so that there is a smooth transition from the source phrase to the target phrase.There are several options to control this transition. Usually there are many possible transitions, if you don't like the one offered by the program, pressing 'Regenerate' will create a different transition. Step 1: Start a new composition. Step 2: Add a new line. Press the 'Structure' button: . You can close the panel as it is not needed now. Step 3: Zoom out the timeline. 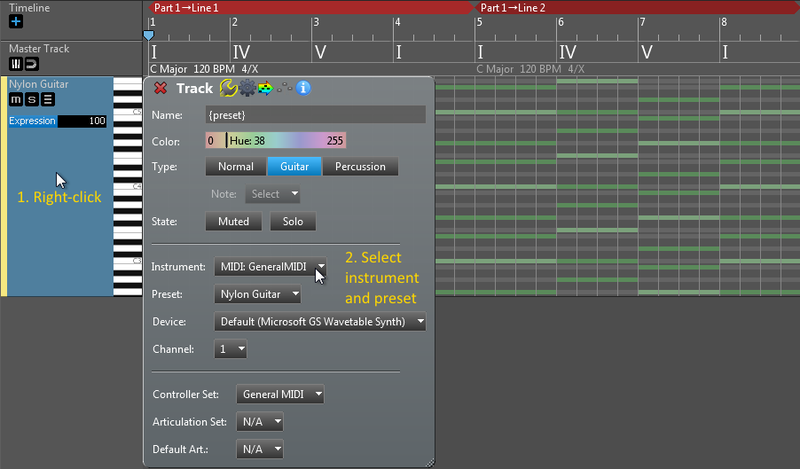 Step 4: Select 'Nylon Guitar' as the instrument. 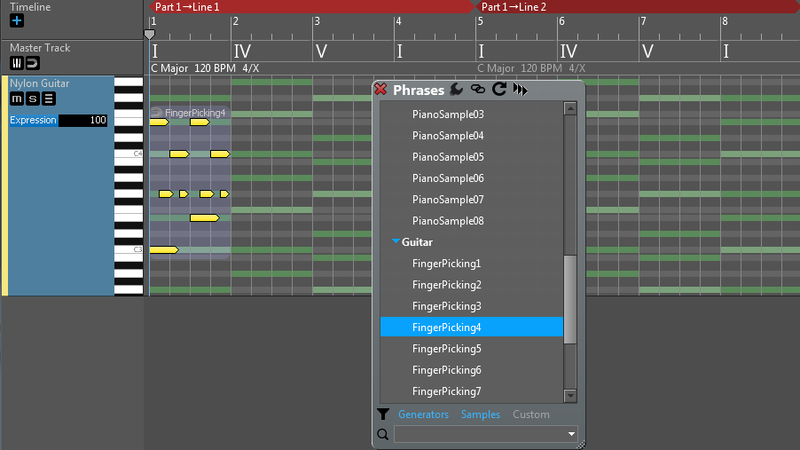 Since we will work with acoustic guitar patterns, select 'Nylon Guitar' as the instrument. Right-click on the track header to open the track inspector. 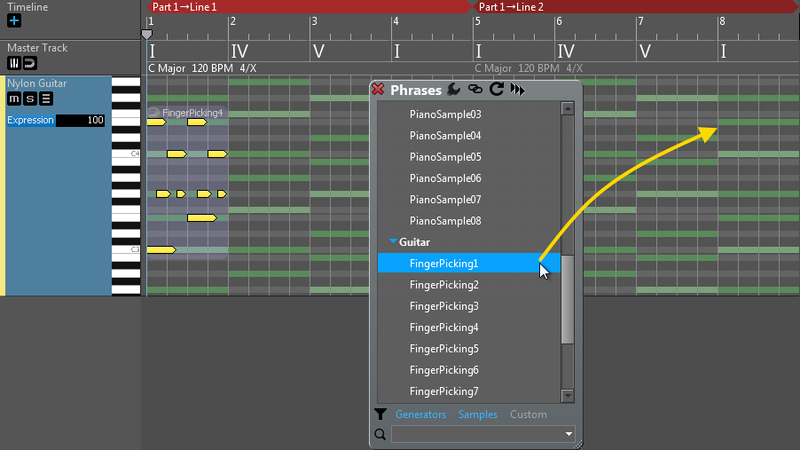 Select 'MIDI: GeneralMIDI' as the instrument, and 'Nylon Guitar' as the preset. You can use the included GeneralUser GS soundfont. 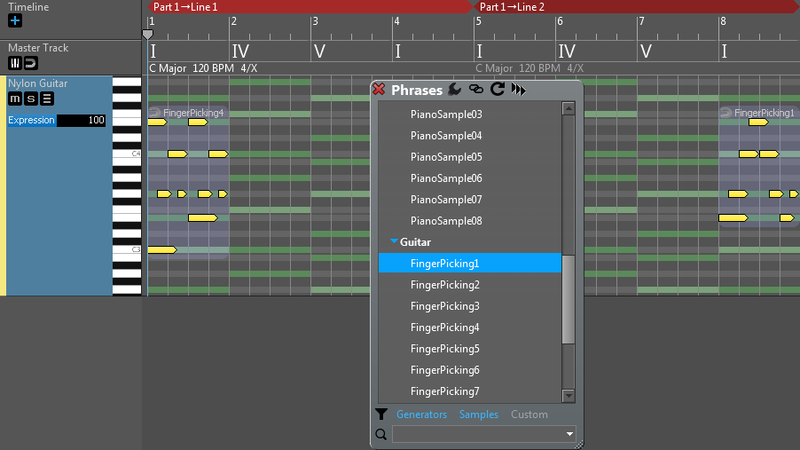 Note: you can choose a different instrument, but make sure 'Use Guitar Chords' is checked in the 'Track Hints' menu. This means that acoustic guitar chords will be used in this track. Step 5: Add the source phrase at the beginning. We will make a transition from 'FingerPicking4' to 'FingerPicking1' in this example. Press the 'Phrase Browser' button: . Sometimes it is easier to double-click on the workspace to add a phrase. 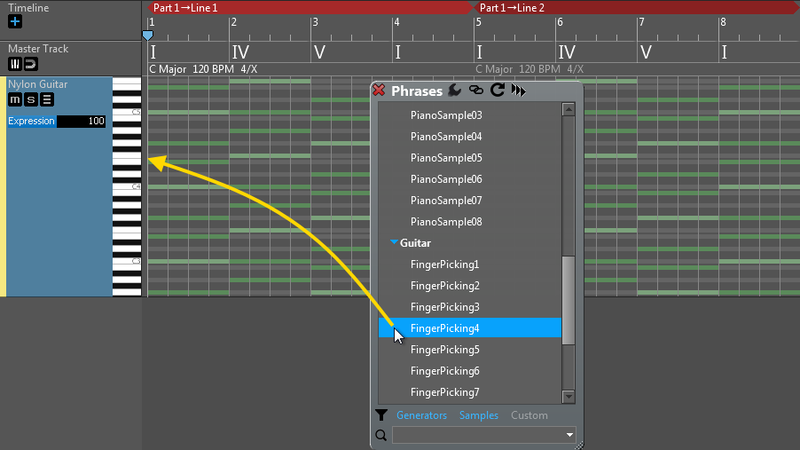 So you may double-click at position 1 on the workspace to insert 'FingerPicking4'. 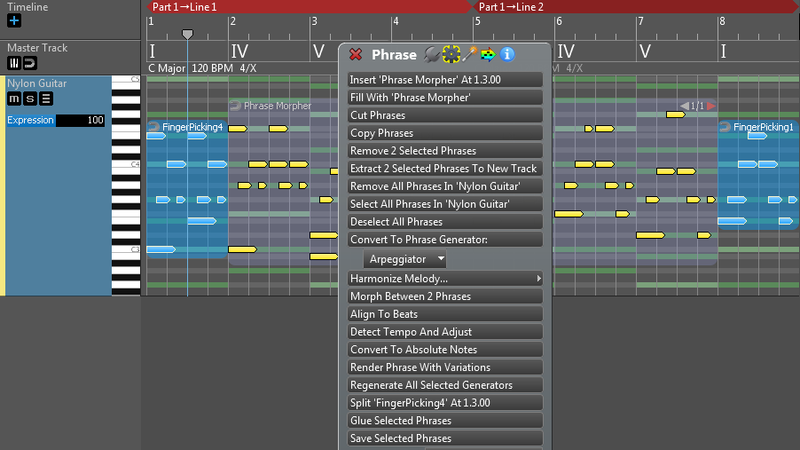 The phrase morpher is added between the source and target phrases, and is filled with generated notes. You can press the 'PLAY' button to listen to the track. Once you set up the phrase morpher, you can transpose or completely replace the source and target phrases. The phrase morpher will be automatically recalculated in these cases. Phrase Morpher has a few parameters that influence the way notes are generated. Right-click on the Phrase Morpher to open the Phrase Inspector. 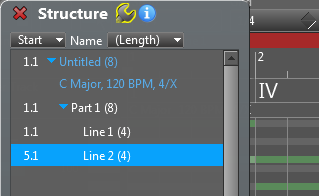 Click on the small 'magic stick' icon at the top of the inspector to show the generator parameters. 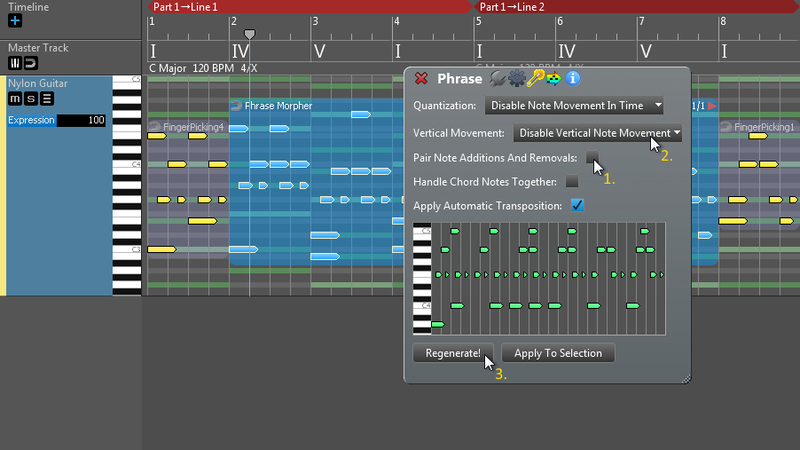 Quantization: Horizontal note movement control. 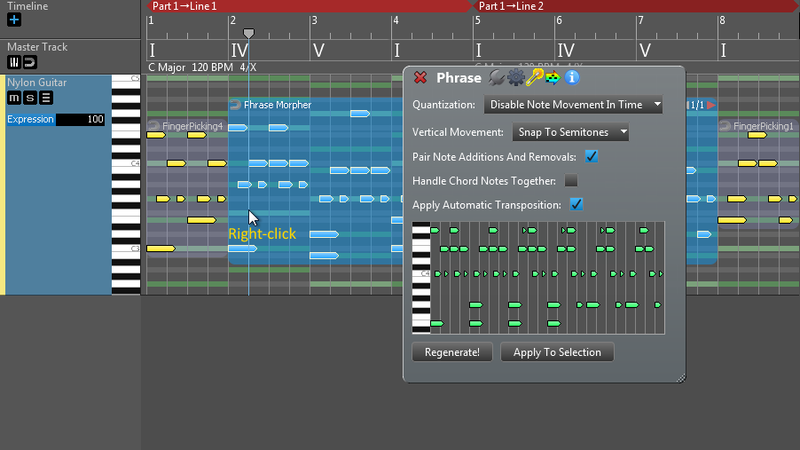 Specify if you allow notes moving in time and if so how they are quantized. Notes moving in time will change the rhythm, so if that is not what you want it is best to disable this option. Vertical Movement: Vertical note movement control. Specify if you allow notes moving vertically (becoming higher or lower notes) and if so how they are handled. Moving notes can be snapped to scale notes or semitones. 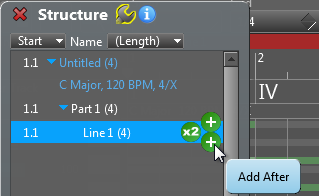 Pair Note Additions And Removals: When checked adding a target note and removing a source note will happen at the same time as much as other conditions allow. This results a smoother transition. Congratulations, you have completed this tutorial! 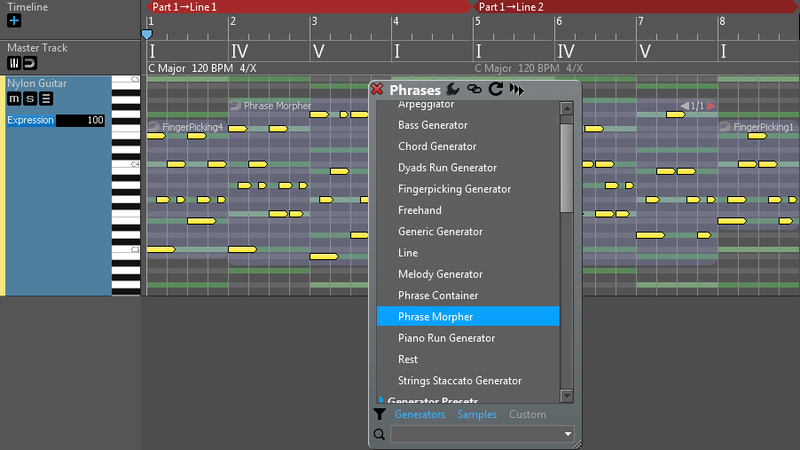 Please note that you can still edit the generated notes in Note Editing Mode, however the Phrase Morpher will turn into an ordinary phrase.